It was with a yearning to know my grandfather better that I began reading them. I admit, I wanted to like them -- there were some lines that resonated, and some quotes worthy to hold close in the opening chapters -- but the rest of that first book fell flat. Like the thing you have to finish just because you started it. The storyline was too linear, too predictable, antiquated. As Jane Eyre is to all of the romance genre, Louis L'Amour is to the western, I thought. Villains make heroes and the heroes are larger than life, powerful, omniscient, preternaturally resilient . . . and a little boring. Like the paradoxical action film that moves along so quickly and emphatically that it loses heart, and loses attention. But maybe that's just me. I need dialogue and imagery and the languor of meandering language to to wrap my heartstrings around. But still, I wanted to like Louis L'Amour books. . . I wanted to understand why my grandfather couldn't stop reading them. . . and to know what had singularly appealed to my husband. The desire to know these things drove me to keep reading. That, and two other things. First, the cover and title of the second book To the Far Blue Mountains is an obvious reference to the Appalachian Mountain chain in the eastern United States. And since Sackett's Landing (circa 1599) made reference to the Outer Banks where the hero wrestles an alligator (really) after crossing the Atlantic Ocean and landing on otherwise unnamed shores, I knew that the mountains he glimpsed, the mountains that tugged at his heart, were just west of the Carolinas. That would make them the very same mountains where my grandfather, and his grandfather were born. Maybe if I kept reading, I would meet them there again in that Great Smoky Mountain range. After all, this was my original purpose for starting these books, to reconnect with my grandfather. And something else pretty fascinating -- Charleston, South Carolina is where the first recorded American patriarch of my grandfather's lineage landed from some far away land in the late 1600's. Had he, too, looked west to the blue tinged mountains with the same longing, accounting for my family's western migration? I had to keep reading . . . just one more book.
. . . Mr. L'Amour left home at the age of fifteen and enjoyed a wide variety of jobs including seaman, lumberjack, elephant handler, assessment miner, skinner of dead cattle, and an officer on tank destroyers during World War II. During his "yondering days" he also circled the world on a freighter, sailed a dhow on the Red Sea, was shipwrecked in the West Indies, and stranded in the Mojave Desert. He won 51 of 59 fights as a professional boxer and worked as a journalist and a lecturer. He was a voracious reader and a collector of rare books. His personal library contained over seventeen thousand volumes. Ummm. . . REALLY? I am humbled and ashamed. How dare I even entertain the slightest notion of boredom in the presence of such a literary god and a true hero. And who am I to scoff at a wrestling match between a marauding alligator and an irrepressible hero that was more than likely a memoir from the author's own life experience? I'm cured. And you can bet your crown jewels that I'm going to keep reading along with Grandpa;) It's really not about Barnabas Sackett, anymore. A few weeks ago, a good friend wandered over to my very sparse web page entitled Prob'ly Need to Get Out More and took note of the single photograph of the Appalachian Trail sign that I had snapped several summers ago when my husband and I were exploring the Great Smoky Mountains just outside Gatlinburg, Tennessee. It was meant to be a place holder because . . . well. . . It is my intention to get out more. But it was also a someday maybe thing. Or maybe just a little more than that because when she sent a simple text message "Let's do it" I remembered wistfully snapping that photo and walking up to the trail just beyond the sign. Just putting my feet on it had evoked a spark of wonder and wanderlust. The next day I bought this book in a little mountain shop, and read it on the the trip home. . . and then tucked it away on my bookshelf. But it only took the right person and three little words to reignite that little spark that I had tucked away with the book. It took me a day and a half to re-read it, my excitement for the adventure building within the context of a most unlikely place and circumstance -- lying flat on my back, inert with the pain of a back injury. But I was not -- will not be deterred. This morning, I was back up on my elliptical, rocking the ramp setting, imagining a steep mountain incline below a rustic canopy of autumn leaves. Just as Bryson was not deterred by the dire warnings that he comically elaborates in the book, neither will I (we) be. Honestly, he is hilarious in recording his adventures. But in all the embellishment, he is also pragmatically real about the rigors of what he quips A Walk in the Woods. He keeps an engaging pace while alternately telling his personal adventures and thoroughly elaborating every other aspect of such an endeavor. He talks about the history and the ever changing construction of each part of the trail, and the condition and quality of amenities along the way from Georgia to Maine. He categorically informs about equipment and supplies. He tells about the wildlife and the people and the beauty, while comically incorporating the physical hardships and the dubious dedication of his trail partner. He's even a wealth of knowledge about the conservation/preservation efforts (or lack thereof) over the last century that have resulted in the horrific and heartbreaking loss of much of our American wilderness. But he is convincing in his exhortation to see what's left . . . and promises that it's still worth the effort of every step (and mosquito and raindrop and hunger pang and glowing pair of eyes . . . ). This is a great read! Even if you're never crazy enough to actually want to sleep in the woods with other questionable creatures (and animals, too) and no cell phone service . . . ;) Living on the edge of this adventure from the warmth of your living room might just be all YOU need. I'm a little crazy. . . and I'm counting on my friend's little spark of insanity to keep its glow til the end. 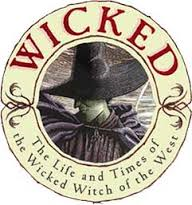 This may be old news for anyone other than relatively recent jumpers onto the bandwagon of Wicked (like me), but if you're counting on the book mirroring the Broadway play, you will be very disappointed. The setting of the play is almost entirely within the context of Shiz, where college relationships begin and evolve and prove their seasons. 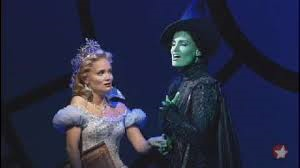 From a popular perspective, Wicked (the play) is a themed story of an enduring friendship - one that evolves against all likelihood in light of the stark differences in the two main characters -- the dark Elphaba (ostensibly) and the light and airy (in every sense of the phrase) Galinda.. The contingent and subordinate theme reveals the "hidden" story of the Wizard of Oz and gives the play its charm and an irresistible cultural relevance. In the 835 page book, only pages 130-368 are actually set at Shiz. The before and after are politically and geographically complex (in a fantastical Tolkeinish sort of way) and allegorically heavy, but the basic storyline is distinct and linear and fairly easy to follow. If you can keep from getting distracted by the political reference that manages to touch on everything from taxation without representation to Irish suppression to animal rights (really every SINGLE American political agenda or activist cause between 1620 and present day), you can probably manage to extract an engaging read that includes (however briefly) the popular themes of friendship, romance, and good vs. evil. No promises or personal interpretations about which prevails in the latter. Also, you might want to check with victims of Game of Thrones if you're prone to getting attached to characters. Just saying. In short, this is not the whimsical read that you might imagine, based on the play, but if you have the time to give it the due diligence it requires to piece together all the important parts til the end, it ends up a good book:). I didn't say happy ending. That's entirely interpretive. The following is a flashback from my Top Ten Moments in 2013. On the Friday after Thanksgiving, I went to the Oriental Theatre in Chicago to see the broadway play production Wicked. I knew it would be good, but I wasn't prepared for the simple clever brilliance by which virtually every theme in the repertoire of my own humanity was represented, how every single line spoke to me. I wasn't prepared for the soul connection or the sudden resplendence of Elphaba rising high above the stage; the transcendence was so tangible that it was like my own personal triumph. Like reconnecting with my own DNA. It was one of the nicest surprises that I never expected all year. I'll carry it with me selfishly, holding it close like all of the mysterious things that I imagine that speak only to me. Like a Steinbeck novel and the poetry of Robert Frost, like the color yellow, and the collective paintings of Van Gogh, like a pre-dawn dream that brings sudden clarity, like the stories of Esther and Joseph in the Bible, like the colors of Christmas through the vail of a snowstorm, like a glass of Merlot on a full moon night. It was like a deep conversation with a good friend. . . the thousandth one you've had, so that it would do no good to try and explain all of the nuances to a third party. If you hadn't lived it, you wouldn't get it. If you had lived it, there would be no need to explain. So I won't. Just know that it was that good. My wish is for everybody this year is to find their Wicked, and then let it carry you home.